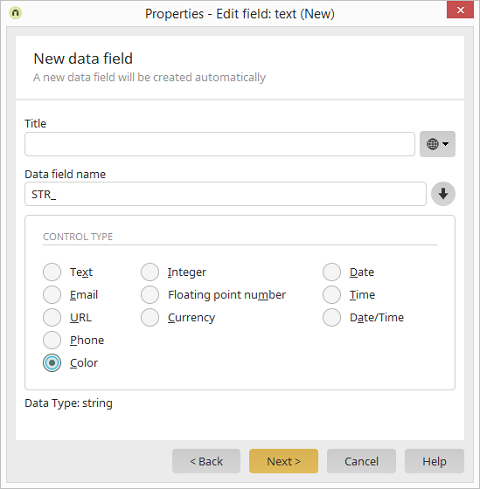 The title of the data field can be modified here. Click here for more information about defining titles. The name of the data field can be modified here, provided the application has not been published. The prefix is updated when the data type (see below) is modified. The actual name is not modified. If the specified name does not possess a data type prefix, changing the data type will leave the name as it is. This means, for example, changing the data type from string to datetime would change the name from "STR_NAME" to "DT_NAME", whereas "TEST_NAME" would not be changed. Applies the title as the name of the data field whereby the prefix is retained. Select the desired control type in the lower area of the dialog.